This is the third installment in a series about a book I'm reading called Stories Done, which is a great collection of tales of excess from counter-culture leaders. 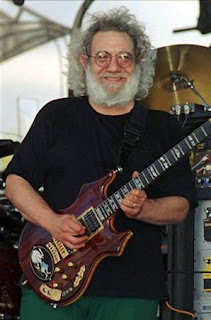 Death hovered over The Grateful Dead's Jerry Garcia his whole life. As a young boy, he watched his father, Spanish immigrant Jose "Joe" Garcia, swept away to his death in a California river while on a fishing trip. His mother, Ruth, died in a car accident in 1970 near Twin Peaks in San Francisco. After trying for years to kick his heroin and cocaine addictions, Garcia was found unconscious by a rehab clinic counselor on August 9, 1995. He had died of a heart attack in his sleep "with a smile on his face," according to his wife.